Swimmers have a language all their own. It can be a bit confusing for those who are just starting out. Please find some of the terms, phrases, words used in the swimming world and their definitions. 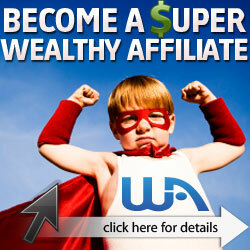 Examples are given to each with a Click Here link. Back Stroke is accomplished with the swimmer lying face up in the water. Swimmer does a Flutter Kick just below the surface of the water while alternating arms in a sweeping motion from swimmer’s hips then up and forward extending pass swimmer’s head. Swimmer breathes naturally in this stroke because swimmer’s head remains above the water. Click Here to see how it’s done. Body Roll is the gentle side to side rotation of the swimmer’s body during their strokes. In the Freestyle Stroke, swimmer rolls and tilts their head far enough out of the water in order to inhale through the mouth or nose. If swimmer tilts to the right side, swimmer’s left ear remains in the water and vice versa. Breast Stroke is accomplished with swimmer lying face down in the water. Swimmer does a Frog Kick for this stroke and legs remain at all times below the water’s surface. Swimmer’s arms work simultaneously coming together in a close clap or prayer movement, then extend forward pass the head and out into a Glide. This stroke can be used as a rest stroke because the swimmer’s head comes out of the water allowing swimmer to take in a long deep breath. Click Here to see how it’s done. Butterfly Stroke uses the Dolphin Kick for the legs while the arms are moving simultaneously from the swimmer’s hips, up and forward in an arc pass the swimmer’s head. Click Here to see how it’s done. 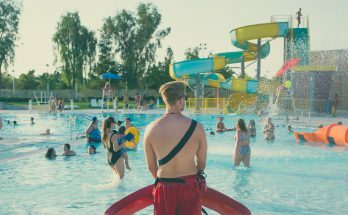 Catch is described when using the Freestyle Stroke, for example, after the swimmer Pulls or extends their arm forward and draws arm back and down through the water, then comes the Catch as swimmer pushes through the water back and then up close to their hips at swimmer’s side. Click Here to see how it’s done. Dolphin Kick is the style of kick used for the Butterfly Stroke. Swimmer starts with the legs touching each other. Swimmer creates with their body an undulating type motion like that of a fish. Click Here to see how it’s done. Finning is done with swimmer’s arms at their side to start then hands raise up along the side of the body simultaneously and before going all the way up to the chest, arms flip back down. Usually this technique is done as a beginner’s Back Stroke arm movement or just for relaxation in the water. Click Here to see how it’s done. Flutter Kick is the kick used in the Freestyle Stroke or for Treading Water. Swimmer begin with body face down and parallel to the bottom of the pool. Swimmer’s legs gently alternate flapping back and forth with toes pointing and soles of feet tapping out of the water’s surface. For Treading Water, swimmer’s body would be upright in the water. Click Here to see how it’s done. Freestyle Stroke is also known as the Crawl. 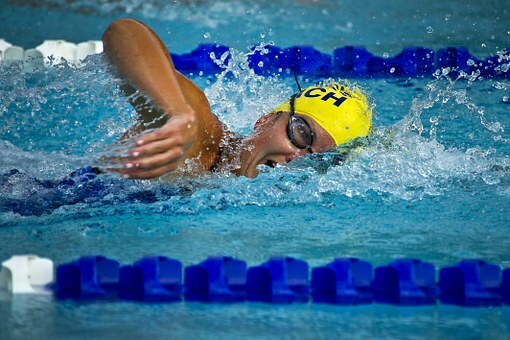 This is the swimmer’s stroke that is predominately used for casual and competitive swimmers. Swimmer starts in a face down in a prone position in the water. Swimmer’s legs are engaged in a Flutter Kick while arms are stroking one at a time, rotating from swimmer’s hip forward and pass swimmer’s head into the water. Click Here to see how it’s done. Frog Kick is used in the Breast Stroke and can be used when Treading Water also. Swimmer’s legs bend at the knees, then feet rotate out (at the knees) and away from the body and circle back and together. Click Here to see how it’s done. Drag is a term used to describe swimmer’s legs sinking in the water and the swimmer dragging the weight of their legs behind them. Swimmer must be horizontal and as parallel to the bottom of the pool as possible. Doing this will decrease drag. Click Here to see how it’s done. Glide is the moment when the swimmer is either face up or face down, prone position, arms above the head or at swimmer’s side and the body is being propelled through the water either from kicking off the pools edge, or from the force of swimmer’s kick or stroke. Swimmer feels as if they are gliding or coasting through the water. 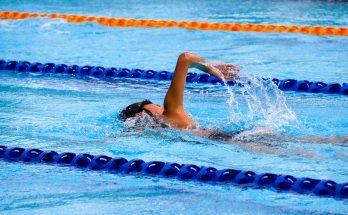 If the swimmer does not perform another stroke, swimmer will eventually loss speed. Click Here to see how it’s done. Kick Board is a flat, lightweight, flotation device used to help swimmers do leg exercises in the water. By holding onto a Kick Board, swimmers keep their bodies afloat without having to do arm movements, while concentrating on their kick techniques. Pull is part of the Freestyle Stroke that occurs when the swimmer is extending their arm forward and then drawing arms back and down through the water back the swimmer’s side. Pull Buoys are used to help swimmers practice their arm technique. The buoy is placed between the swimmer’s knees or thighs. It enables the swimmer to stay afloat without kicking. Click Here to see how it’s done. Sculling is an arm movement usually used in Treading Water in order to keep the body up and at the surface of the water. This movement can be done vertically or horizontally. Swimmer’s arms are extended at swimmer’s side, bending at the elbows. Swimmer brings both arms in as if swimmer is about to clap, but doesn’t completely bring the hands together, instead swimmer flips their hands around, twisting at the wrists and brings their arms back out to their sides. Click Here to see how it’s done. 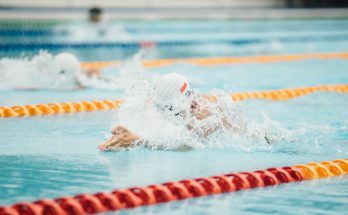 Swimming Drills are exercises that a swimming teacher or coach will ask their students to perform repeatedly of specific parts of the swimming stroke techniques. Students may be asked to Freestyle up the lane, Tumble Turn at the end and return down the lane with the Back Stroke, for example. Tumble Turn is exactly as it sounds. Swimmer, engaged in the Backstroke or Freestyle, pushes off the pool’s wall and does a somersault, turning the body around to return in the direction swimmer just came from. These turns are used in competitive swimming allowing swimmers to quickly turn around and continue their laps. Click Here to see how it’s done. If you come across a term that you are unfamiliar with, please leave a comment below so that we can add it to the list. Our goal is to make this list as comprehensive as possible. If this information has been helpful to you, please lease a comment below.